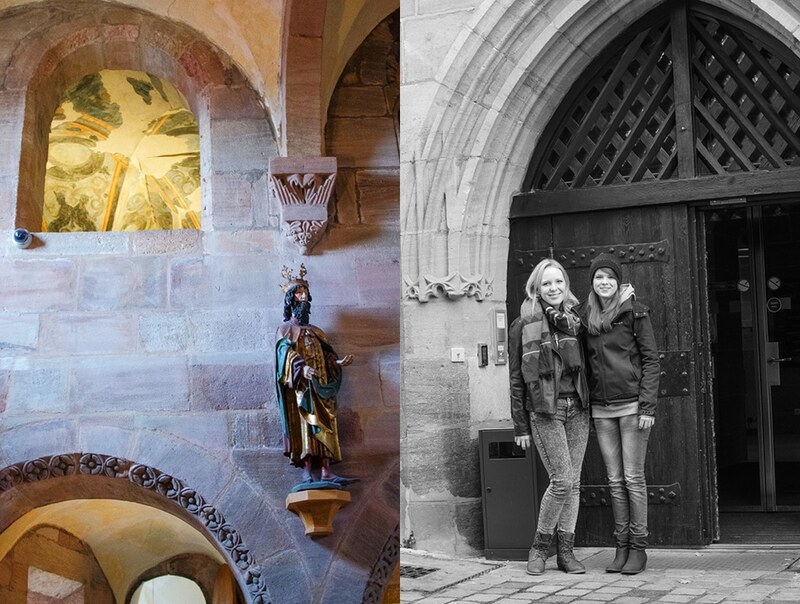 How many of you have Nuremberg on your list of must-visit holiday spots? For me it is way up there on my Christmas holiday list with its world renowned Christmas market and great holiday events. Actually, there is probably no better place to be at Christmas. But I must confess that outside of the holiday season it was not in my top 10. 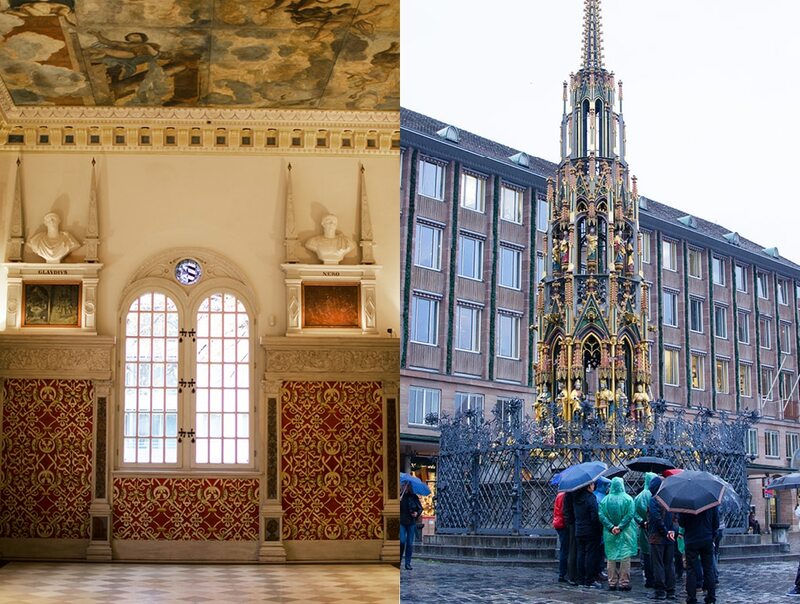 So when I got an invitation to visit from the local tourism board, I jumped at the chance to see what’s going on in Nuremberg the rest of the year. And what a surprise! At Christmas time the market on the main square is such a draw that you really don’t have much time left to look elsewhere. 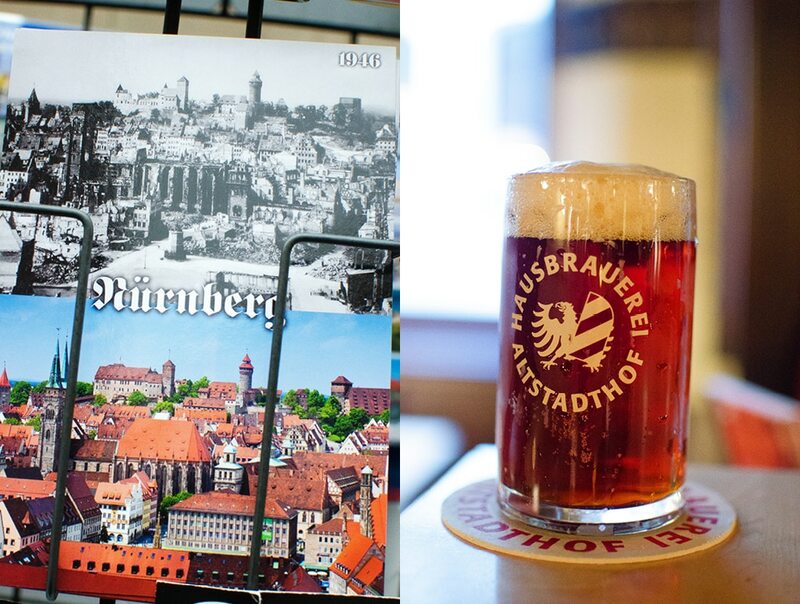 And that’s too bad because, as we discovered, Nuremberg has way more to offer. – The city of Nuremberg has just shy of a half million inhabitants, and another 3.5 million in the larger metropolitan area. That’s a good sized city. 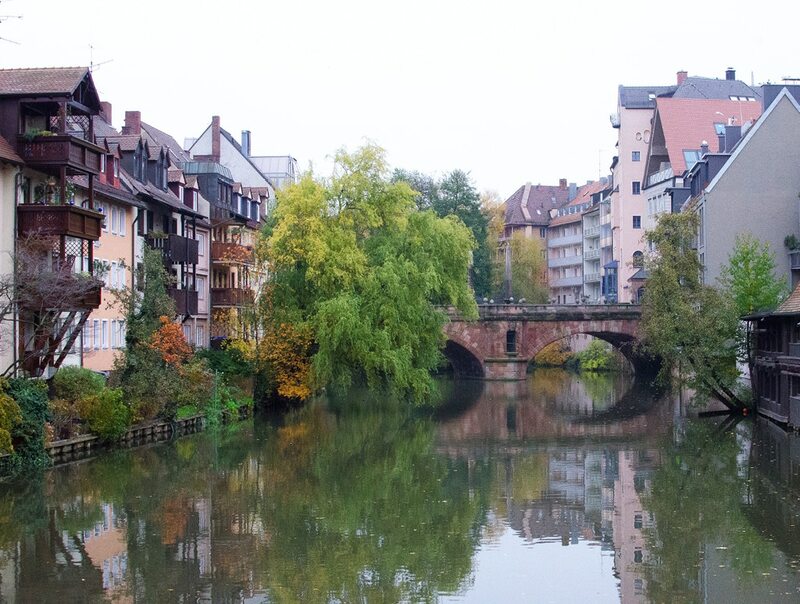 In addition, the city is large area-wise, and to cover all that ground, Nuremberg has a great transportation system. It is easy and inexpensive to get around. 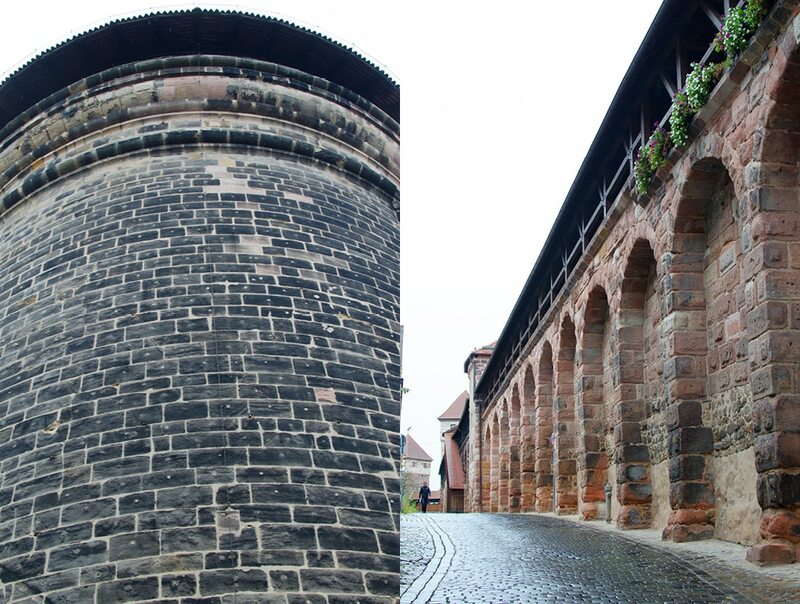 – Nuremberg is today the biggest exporter of ginger bread, and way back in the 13th century this delicious treat was being baked in the city by specialized guilds. 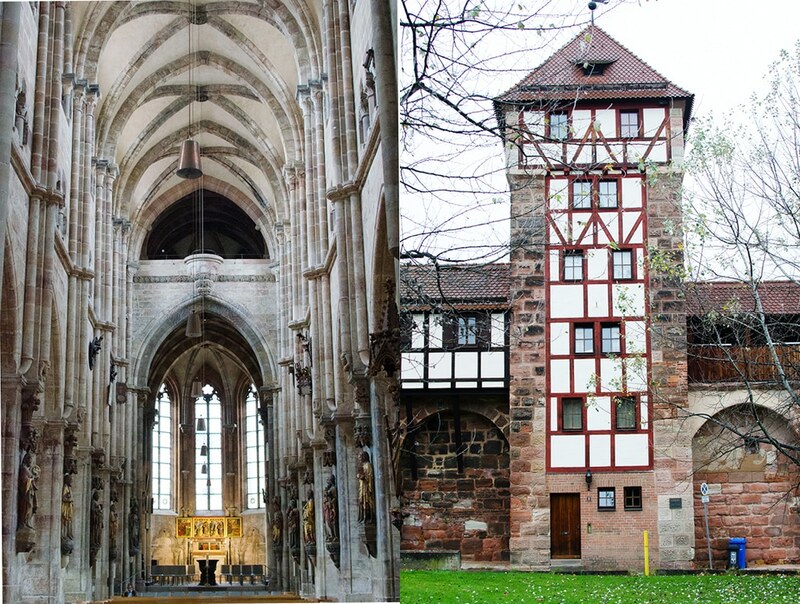 Nuremberg is a crossroads city and trade routes from the east found their first trading opportunity in Europe when they arrived there. So spices were readily available in Nuremberg, but remained rare in most other places. 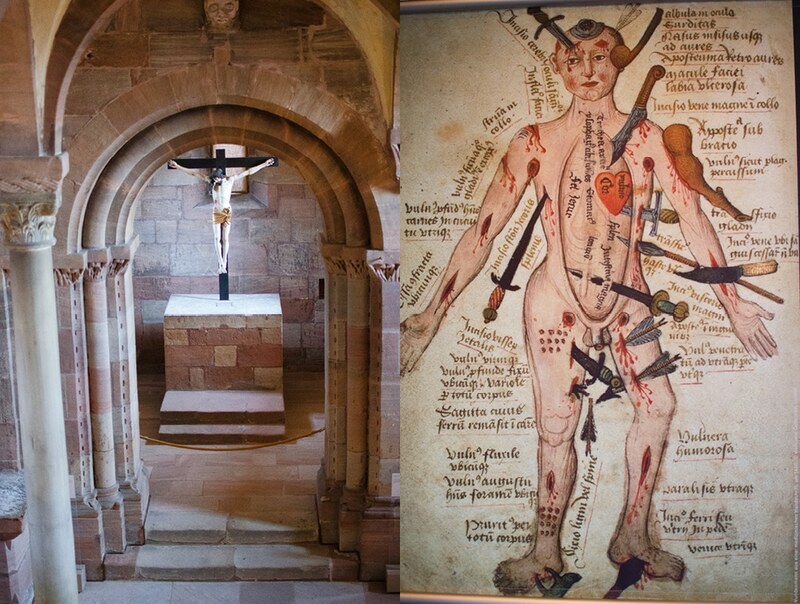 – In the 15th century Erhard Etzlaub, a compass maker by trade, came up with a great marketing idea. He developed the first “Romweg” or “The Way to Rome” map. This is the first European road map and the thing that eventually led to the Google map you may use to get around today. Etzlaub’s map was used by pilgrims heading to the Christian capital and included information on accommodations and places to eat along the way. He got his data from the traders that traveled to and from Rome regularly. And just like Google, Etzlaub updated his map regularly. – Around the 17th century the first clarinet was developed in Nuremberg in the small workshop of Christoph Denner. Today Nuremberg has an impressive classical music program which is especially active in the summer months. – In 1875 Nuremberg was one of the first major European cities to get electrical street lighting. All that trading going on in the city made lots of money which enabled investment in the latest technology. – The cough drop was invented in Nuremberg, the first one being made in 1923 by Dr. Carl Soldan. The drops were branded as Em-Eukal and are still on sale today. They were likely used by Henry Kissinger who was born in the adjacent town of Fuerth, where he lived until 1938 when he fled the Nazis for American shores. 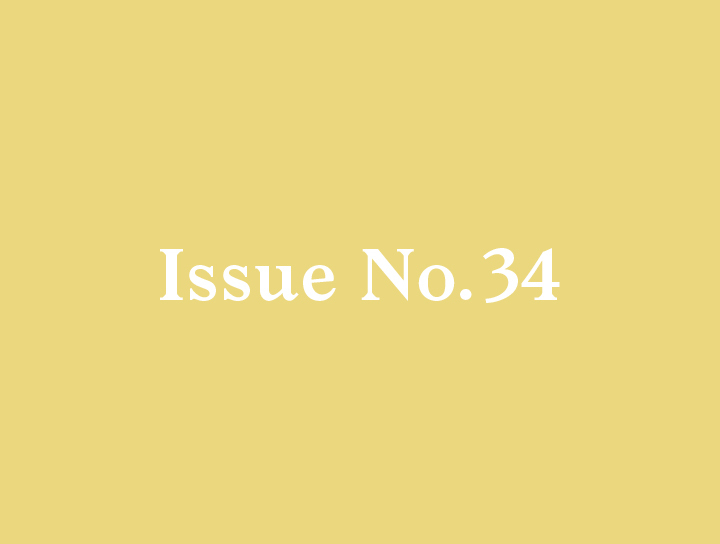 – In 1924, 16 years after the American company Converse invented the modern sports shoe, two bothers from the adjacent town of Herzogenaurach got on the bandwagon and started their own sports shoe company. It did not go well and the brothers started feuding. The company broke up and each started their own company. The competition that followed between Adidas and Puma has fueled constant innovation ever since. – In 1927 all the things that had made Nuremberg such a successful and vibrant city became its downfall. Hitler loved the city and chose it as the centre of his Third German Reich. When Hitler was voted into office in 1933, Nuremberg became the centre of all Aryan ideas and the Nuremberg laws, stripping Jewish citizens of their German citizenship, were initiated. In the end, because all the strife started in Nuremberg, the allied forces chose Nuremberg as the location to put the Nazi leadership on trial. The place of the Third Reich’s origin became the location of its end. 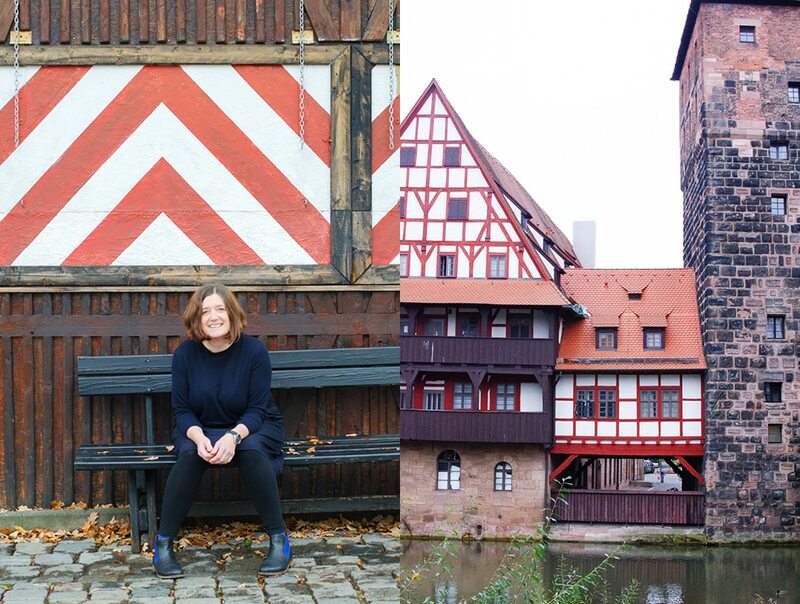 One of the first things that caught my attention when we arrived on the train was a postcard, half in black and white showing a heavily bombed Nuremberg, and on the bottom was the beautiful vibrant Nuremberg you see today. It made me think how far the community has come in order to look beyond that dark period and rebuild with the vibrant open energy you experience today. We picked a hotel a bit above the main square so we could explore the old town without too much hill climbing. Parts of Nuremberg are pretty steep! We stayed at a lovely, newly-opened boutique hotel called Hotel Elch. 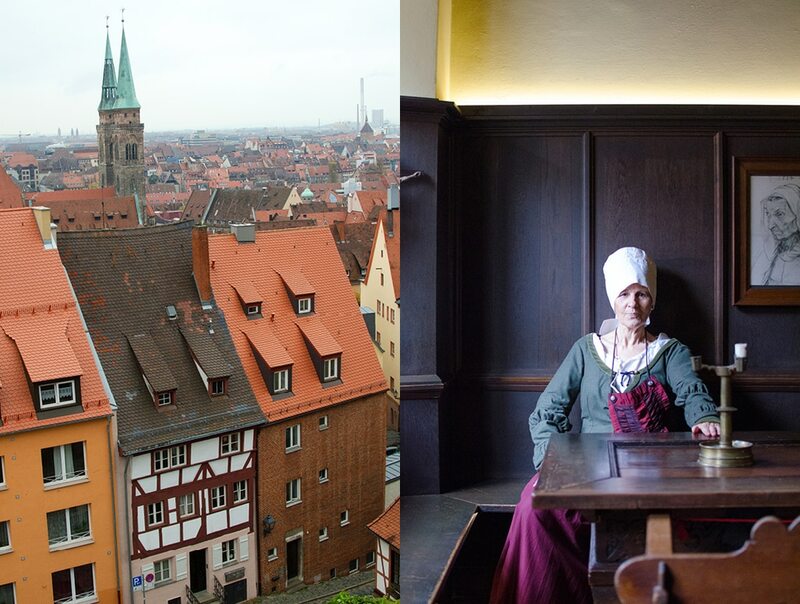 The building has been in the lodging business since 1342, so staying at Elch you are walking in the steps of traders and pilgrims from many centuries past. 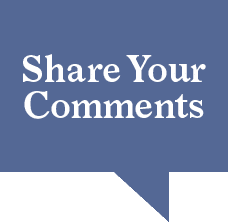 You will not, however, suffer any of the inconveniences they likely faced. The rooms are completely modern and equipped with all the amenities. 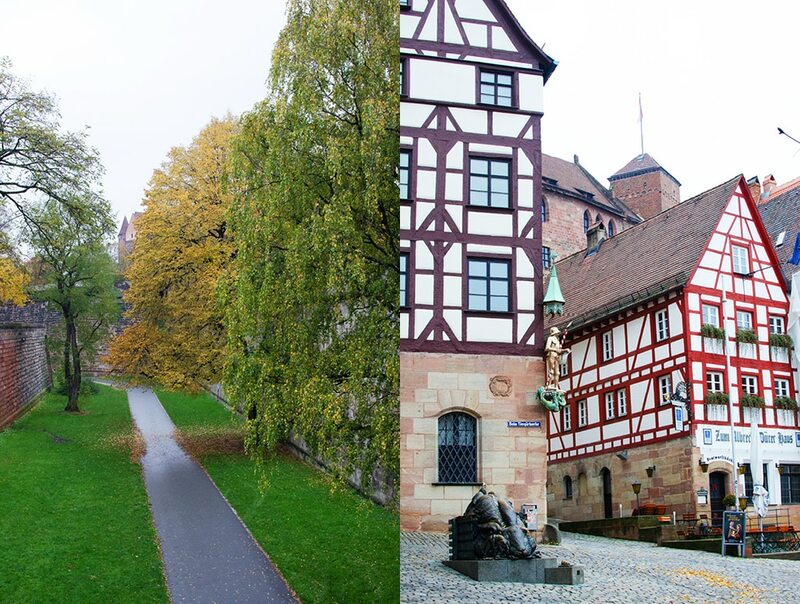 A short walk up from Hotel Elch is the Kaiser Burg, the imperial castle of Nuremberg. Early records indicate that the first parts of the building were constructed around 1050. Major building works did not start until a century later during the reign of King Conrad III in 1140. In the 13th century Nuremberg became an Imperial free zone, a major turn of events because free cities at that time enjoyed more autonomy and had only the emperor to report to. That made trading, tax collection and administration a lot easier and more lucrative. Along with the new freedom came responsibility for the castle’s building works and maintenance. And during this period the castle grew substantially in size with many out-buildings, towers and moats being added. The castle today, quite literally, towers over the city. The large “Luginsland” or the “look into the land” tower was, when built, the largest structure anyone had seen. During WWII the castle was mostly destroyed leaving only the Roman Chapel and the Sinwell Tower intact. 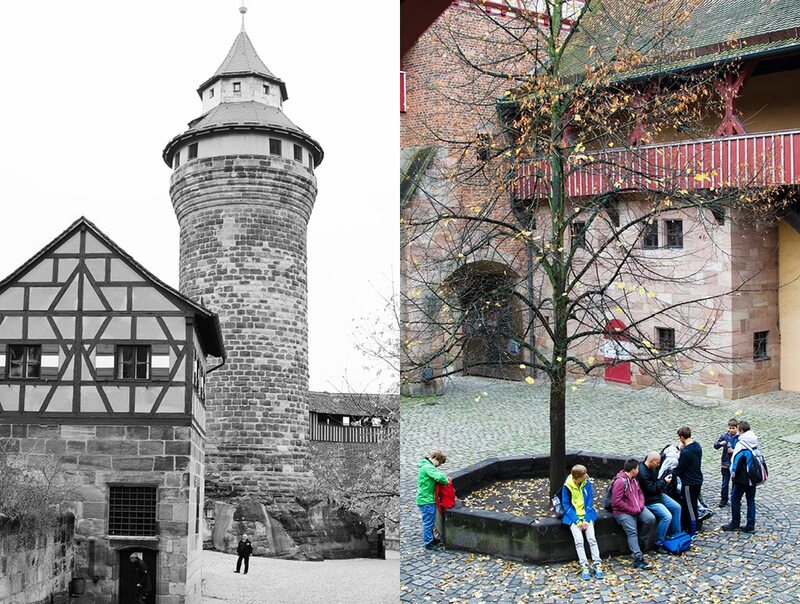 But like much of Nuremberg, the castle was reconstructed to appear as if nothing happened. Without the benefit of the numerous before-after postcards in souvenir shops around town you would never know that it was ever destroyed. 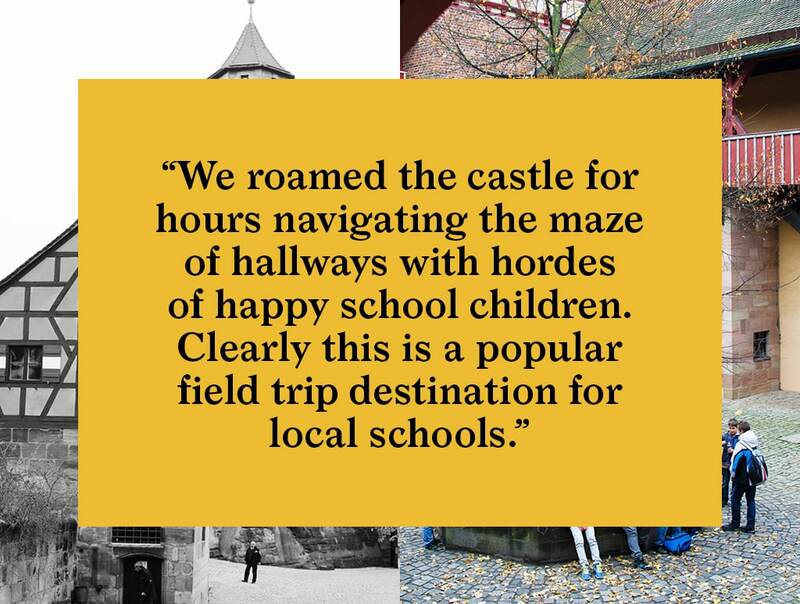 We roamed the castle for several hours navigating the maze of hallways with hordes of happy school children. Clearly this is a popular field trip destination. Feeling a bit peckish after our castle wanderings we hop on a bus and head to our next destination just a few stops away. In Germany there is a kind of cafe known as a Konditorei. Traditionally it was the place you would go to for coffee and cake, or as the locals say “Kaffee und Kuchen”. As convenience and chain stores take over more and more space on city streets, the traditional Konditorei is not as prevalent as it used to be. 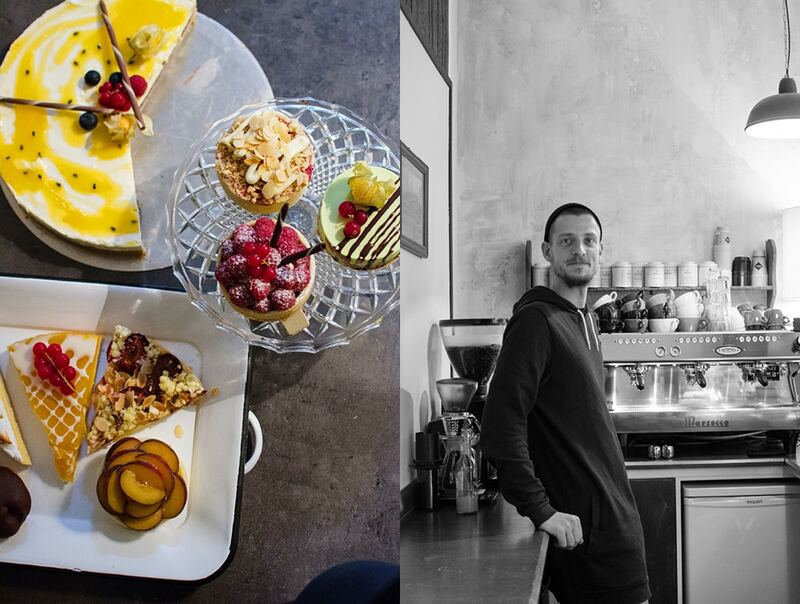 Cafe Wohlleben owner Alexander Hilderbrandt is putting a new spin on the tradition, bringing it up to date with an extraordinary emphasis on the “Kuchen” part of the business. His beautiful and delectable creations make an afternoon break a real special event. And heading up the “cafe” part of the experience is barista Sarah Schweizer. Her coffee brews are just as special as the sweets they accompany. And the two together are a dream. Quite an upgrade from the old filter coffee and Bundt cake which is standard Konditorei fare. 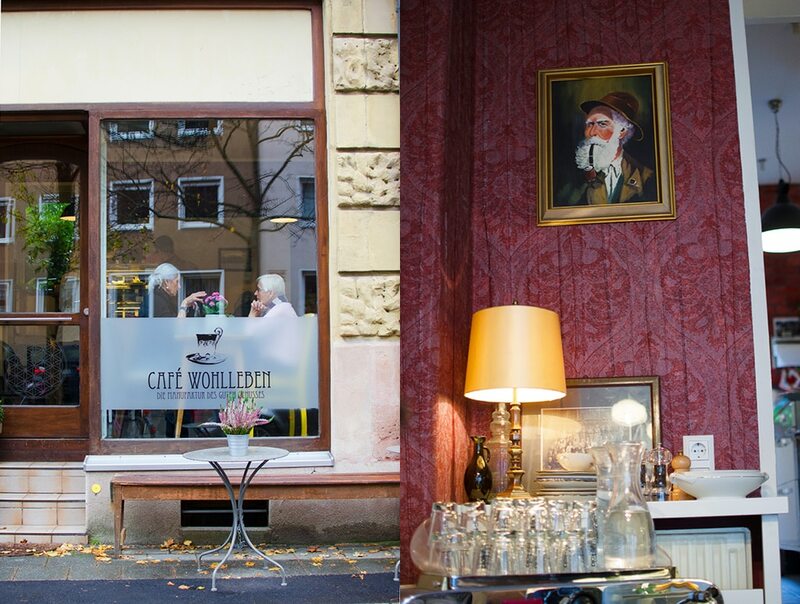 With an eclectic mix of antiques and modern elements, Cafe Wohlleben has been assembled with an eye towards the Konditorei tradition. During our visit patrons streamed in: elegant German ladies, young students, a group of office colleagues, a real diverse crowd all joined by their common interest in coffee cake and sweets. Now well-nourished and with plenty of calories to burn, we hop on a streetcar and head for the centre of town. We head through town on the Königstraße, the old road that carves a path from the train station up to the main square. Not far from the station we head off into a small courtyard called “Handwerkerhof“, or the Craftsman centre. Here you can find an array of quaint old shops reminiscent of the medieval village that Nuremberg used to be. 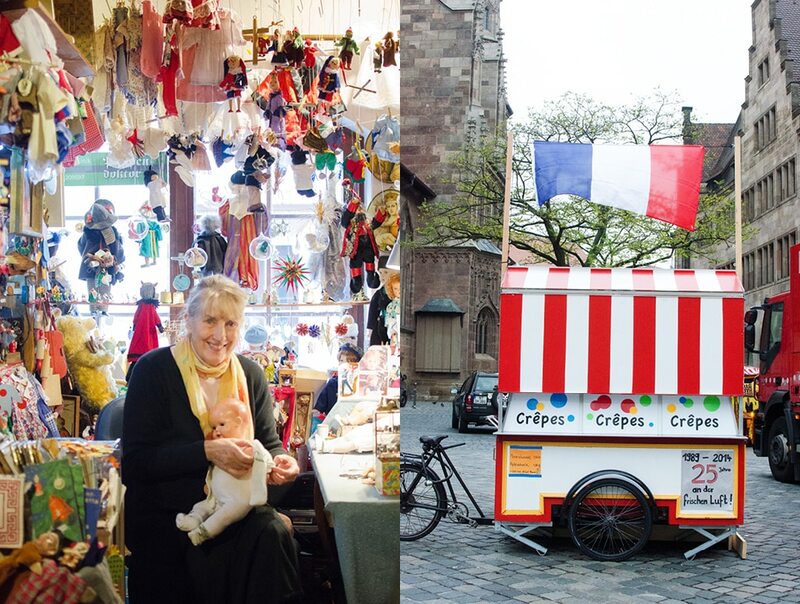 Most of the stores specialize in local arts and crafts so it is a great place to find small handmade gifts authentic to Nuremberg. 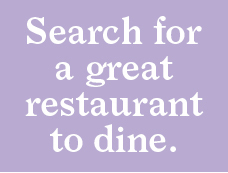 Along with the local crafts you can also experience the local cuisine here. In the middle of all the shops there’s a “Bratwursthaeusle” or “sausage house” called Bratwurst Gloecklein. It is a lovely old-style setting and often less busy than the other Bratwursthaeusle up next to the main square. 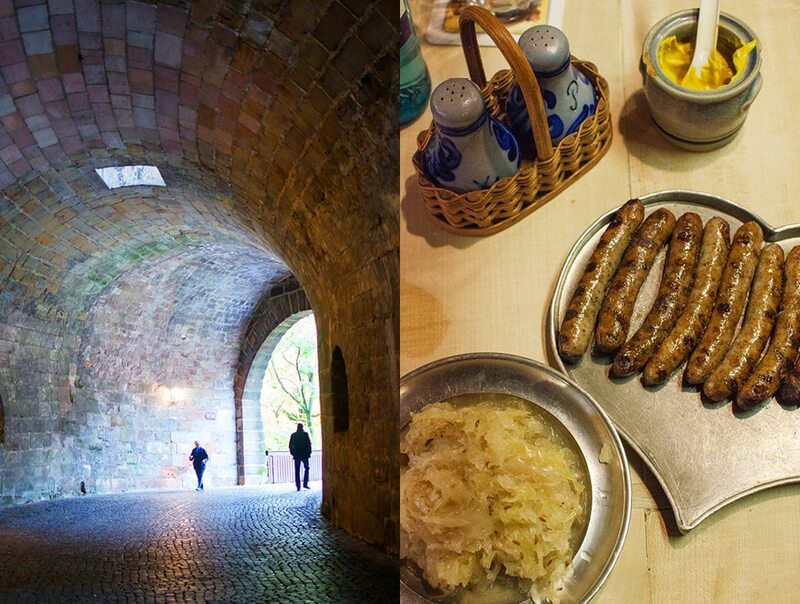 It is almost obligatory to try the famous “Sechs auf Kraut” (six Nuernberger Sausages with cabbage salad). Aside from the fact that they do not serve much else other than the six sausage dish, they are really good. Fun food fact: The “Nuernberger” sausage is a trademarked object for its size, shape and ingredients, and can only be served in even numbers. Those Nuernbergers are very serious about their sausages. Just beyond the courtyard the scene changes from medieval to futuristic. 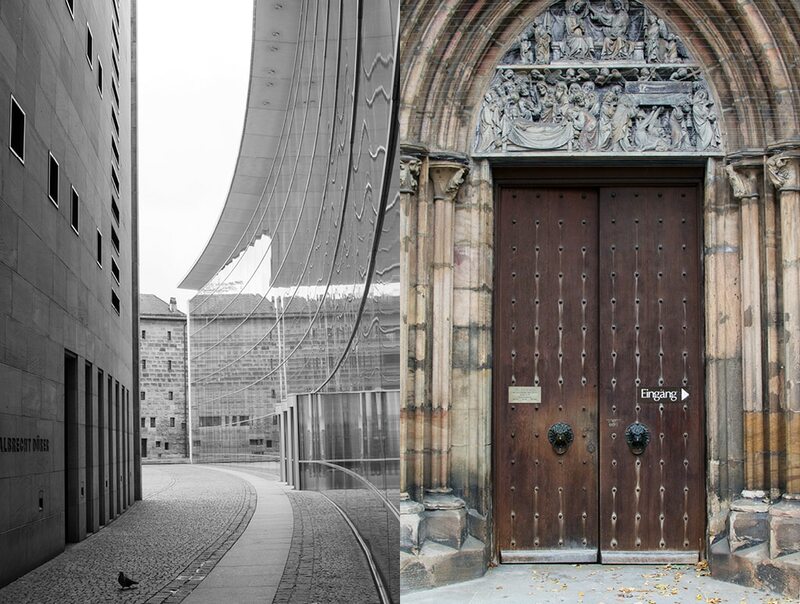 Nuremberg’s New Museum opened in 2000, designed by Berlin Architect Volker Staab. It is nestled in-between older buildings and its striking modernism makes it eye-catching by contrast. 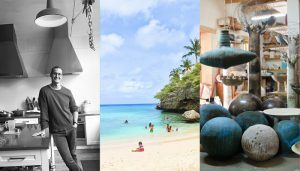 In its 33,000 square feet of space it houses contemporary art, sculpture, video and design. The side of the museum opens to a courtyard and the vast glass wall reflects the old buildings across the way. This makes it fit right in with the surrounding medieval buildings in an odd-modern-gleaming kind of way. Now we make our way through the city towards Hauptmarkt, the main square. Crossing the Pegnitz River we avoid the main bridge and take the pedestrian bridges that cross the western tip of Trodelmarkt Island. This is a great place to see the river from a lower vantage point. And as a bonus you walk right by the Henkersturm, “The house of the hangman”. I guess no one wanted to live next to this guy so he was stuck out in the river on an island. At the Hauptmarkt there is a market every day and of course this is the site of the famous Christmas market. Walking through the square there is an abundance of food carts and we taste our way from one side of the market to the other, trying all sorts of foods from cheeses to crepes to gingerbreads. If you are lucky to be at Hauptmark at the stroke of noon go over to the main church on the square, the Frauenkirche. There you will witness the famous “Maennleinlauf” or “men running”. When the clock strikes noon, look up at the clock tower to see seven life-sized Archdukes shuttle pass Kaiser Karl. Reinhard Engel is the owner and brewmaster of Hausbrauerei Altstadthof. In 1984 Reinhard decided that he wanted to create a new kind of small-scale brewery using only the purest local ingredients. Nowadays we hear a lot about organic, sustainable micro brewing, but in the 1980s this was nearly unheard of. Reinhard was a pioneer and had his microbrewery running years before it occurred to anyone else that this might be a good idea. Now whenever a microbrewery starts somewhere in the world, it is likely that the brewers call Reinhard first to learn how it’s done. Reinhard took us down into the heart of the operation. 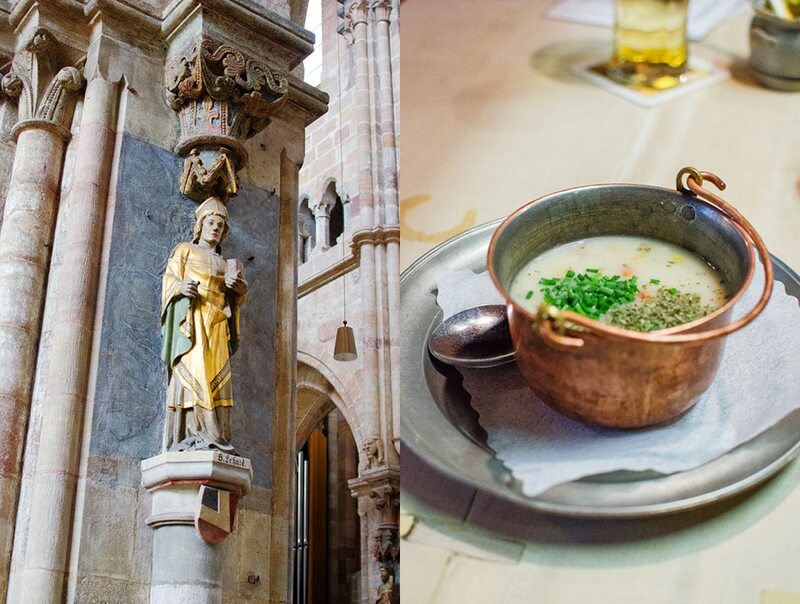 It’s just a few steps from his pub so when you drink at Hausbrauerei it really could not be any fresher. The traditional copper kettles he uses are really old school. From the brewing room he took us down into the tunnels underneath the city where Reinhard stores his barrels taking advantage of the constant temperature. I would not call myself an expert on beer. It is not really my drink of choice, but when in Rome… Reinhard offered me one of his specialty brews, the Rotbier (red beer). I definitely could taste the difference. It is very smooth with a delicate touch of hops and a dark copper color. Before our departure Reinhard made a quick detour to give us a peek into his latest venture, a micro whiskey distillery. Apparently it is not a drastically different process to distill whiskey than it is to brew beer, so a few years ago Reinhard decide to give it a try. And now the first barrels are just about ready to go. There are regular tours of the operation so you learn all about micro brewing. And next door is a great little shop with nice gifts and treats to buy for all your beer loving friends and family members. The next morning we walk down to the train station, board a street car and journey out of the center to the Southern district of Nuremberg. Today we are visiting the infamous Documentation Centre and Nazi Party Rally Ground. The Museum, or Docu Centre as it is called, is located in the North wing of the former congress hall designed by the National Socialists party to house 50,000 spectators. Its unfinished state gives it an eerie ominous feeling. 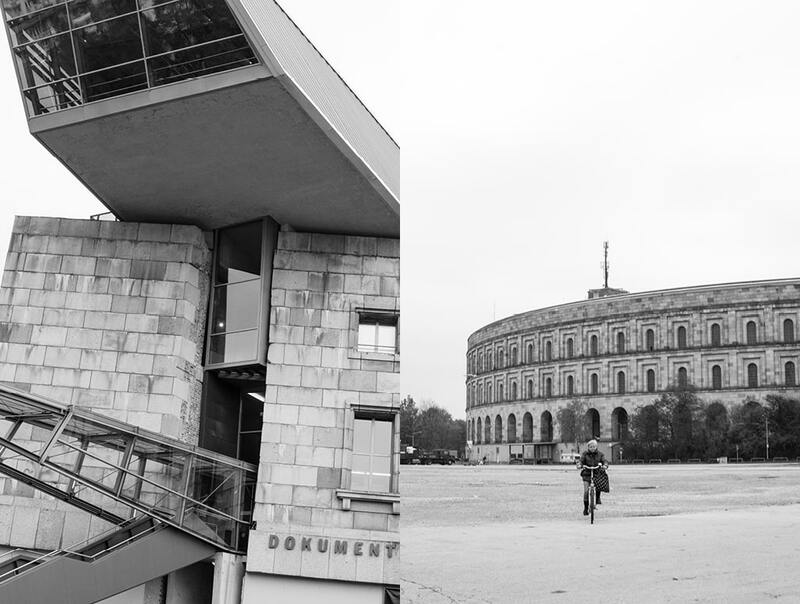 Inaugurated in 1994 The Docu Centre was designed by Austrian Architect Guenther Domenig who himself had a family connection with the institution’s subject matter. His father was a judge during the Nazi regime. At around 45,000 square feet, the permanent exhibition is titled “Fascination and Terror”. The exhibition takes you step by step through the complex social events that led up the creation of the Nazi party, its brutal exploitation of the population, the war, and the final reckoning at the Nuremberg trials. The presentation is dense with detailed information and illustrated with artifacts and the copious documentation generated by the Nazis themselves. What I found interesting, and at the same time chilling, is that by looking at events that occurred in Nuremberg step-by-step, you can better understand how small actions accumulating over time can easily lead to such a horrific result. Each step in itself can seem relatively benign but they have a momentum that builds up and becomes unstoppable. I would recommend everyone make to visit the Docu Centre to get perspective on these horrendous events. The retelling of this story is applicable to current events and is worth pondering to better recognize the danger signs when events are carrying us along. Take advantage of the headsets on offer which will really help to navigate the dense and sometimes difficult subject matter. Although ending on a somber note, this was a great trip and Nuremberg really surprised us in the variety and breadth of experiences it offered. We did not have time to see all that we wanted but we will certainly be back for another visit soon to take in more. Planning a visit to Seattle? Here is the current weather and what to expect for the next few days.